If you live on this side of our solar-system, you are guaranteed to have heard of Kubernetes before. You may not know what it is exactly. But that’s okay. Even if you haven’t heard of it before, stick around and find out. It’ll live up to your expectations. I promise Kubernetes is not a crazy hamster at the helm of a catamaran. For all you know and care it might as well be, but no, it’s not, really. However, that would be awesome to see. If you want to jump to relevant topics covered in this guide feel free to do so by pressing any of the links below. Does anyone know what “kubernetes” even means? Apparently, if there are Greek readers, you’ll know. It means helmsman or pilot. How does this relate? Whoa… Okay, let’s break that down. Kubernetes, also called K8s, is a system for automating deployment, scaling and management of containerized applications. It was developed by Google, and announced in mid-2014. Many of the key developers were previously working on Google’s in-house orchestration system called “Borg”. Following the release of Kubernetes v1.0 in the summer of 2015, Google open-sourced it and partnered with the Linux Foundation in a joint effort to advance the technology. Let’s break down Kubernetes even further. Imagine it like this. You’ve created a Docker container to wrap your application. But you still need to manage the various DevOps tasks for deploying and managing your containers. Here’s where Kubernetes steps in. It will handle all the crucial deployment, scaling and management steps so you don’t have to. It’s essentially a tool for managing your containers. A platform of sorts that holds your hand along the way. It’s up to you to create a network of intertwined containers, tell Kubernetes what to do, and how to serve your containers. Why do I need Kubernetes…? Easy! Peace of mind, period. You don’t have to worry about every instance you own. Nor, do you need to worry about whether the containers are running. If an instance fails, Kubernetes will re-create the containers of the failed instance on one that’s running. Fabulous! In the sense of Kubernetes, a cluster would be a coupled network of containers connected in such a way they can freely communicate with each other. Not to dive too deep into the inner working of Kubernetes, here’s what we need to know. The machines on which a cluster is running can either be Masters or Nodes. The naming makes sense. The Master is the control panel of the whole cluster. All commands we will run will be run on the Master instance. It will then decide which Node, or worker machine, in the cluster will take the workload. In order to enable the communication between the various containers in the cluster we need a network to provide IP addresses to them. Luckily, Kubernetes has a wide variety to choose from, and thankfully they work like magic. Here’s a more detailed explanation. In all essence, such a network enables the pods in a cluster to talk to each other. I’m sure you’re now wondering how the nodes communicate with each other. Well, every Node has a Kubelet, which is an agent for managing the Node and communicating with the Kubernetes Master. All of this is glued together with the Kubernetes API which the Master exposes. We then use the Kubernetes API to directly interact with the cluster using a CLI tool called kubectl. More about this further a bit down. Apart from the API, what enables Kubernetes to work properly is a globally available configuration store called etcd. It’s a distributed key-value store that can be distributed across multiple nodes. Why is etcd so important? It stores configuration data for all of the nodes in the cluster so each and every part of it knows how to configure itself. A Kubernetes object is a single unit that exists in the cluster. Objects include deployments, replica sets, services, pods and much more. We’ll focus on these main objects in the scope of this tutorial. When you create an object you’re telling the Kubernetes cluster about the desired state you want it to have. Kubernetes Objects are persistent entities in the Kubernetes system. Kubernetes uses these entities to represent the state of your cluster. Desired state means the cluster will work to keep it like you specified, even if a node in your cluster fails. Kubernetes will detect this and compensate by spinning up the objects on the remaining nodes in order to restore the desired state. With that understood, let’s define the objects we’ll be working with. Pod — a group of one or more containers (such as Docker containers), with shared storage/network, and a specification for how to run the containers. Even if the pod has several containers, they will all be reachable in the network through a single IP address. Service — an abstraction which defines a logical set of Pods and a policy by which to access them. Pods have a life cycle. They get created and die. We need a way to make them accessible on a regular basis, even if they are re-created. By giving Pods a certain label we use a Service to route traffic to all Pods with that particular label. Voila! Reliable access to Pods even if they are re-created. ReplicaSet — give Pods a label and control their replication. Nowadays they are only used through Deployments. Deployment — describes the desired state and makes sure to change the actual state to the desired state if needed. A deployment manages Pods and ReplicaSets so you don’t have to. Just like magic! The Deployment instructs Kubernetes how to create and update instances of your application. Once you’ve created a Deployment, the Kubernetes master schedules mentioned application instances onto individual Nodes in the cluster. Do you need Kubernetes clusters? I can’t seem to find a single reason why not. Even if I had a single instance running on any of the many cloud providers out there, I’d go for a cluster setup. The deployments enable rolling updates, meaning zero downtime. I can have several instances of apps running at the same time, in parallel as well! But, there’s always a but. It’s a bit fiddly to understand volumes and persistence. Containers are stateless after all. You need to create some sort of persistent storage, or use a 3rd party DBaaS. But, that’s all the craze now anyhow, with services such as AWS RDS and MongoDB Atlas. The peace of mind is what I like. Not having a headache at the end of the day is what floats my boat. We’ll use Minikube for development, a lightweight Kubernetes setup. It creates a tiny VM on your local machine, and deploys a Kubernetes cluster with a single node. There are a couple of steps we need to go through in order to install Minikube. Let’s jump in. 1. Install a virtualization software. Either VirtualBox or KVM2 will do just fine. I’ve found using VirtualBox is the easiest way to go about this. Here’s the downloads page where you can get started easily. Kubectl is the CLI tool for interacting with the Kubernetes cluster. Jump over to the official page, pick your OS and run the provided commands. It’s really simple, here’s how you do it on Ubuntu. You can find the other samples on the link I added above. Docker will be tasked with creating and managing containers. Two more commands, if you’re on Ubuntu. Otherwise, jump over here for the Windows setup, or here if you have a Mac. Only one more command for Ubuntu. Jump over to the official Minikube docs to find the commands for Mac and Windows. Your development cluster is up and running. To make sure it works, run a simple get nodes command. The output should show you the basic cluster info, as you can see below. With that running like a breeze, let’s see how to install Kubernetes on a server. Feeling brave? I sure am. Let’s quickly go through the steps of installing Kubernetes on a real server in the cloud. For this endeavor you can choose any cloud provider you want. I’ve used these very steps on DigitalOcean, and the installation takes less than 5 minutes. The only thing you need to keep in mind is to add all the VMs you provision to the same Virtual Private Network. They need to have private IPs through which they’ll communicate with each other. From what we learned above, one instance will be the Master while all the others will be worker Nodes. Let’s jump into installing Kubernetes on the Master first. Every cloud provider will give you a set of steps to follow in order to connect to your VM. They involve an ssh command and the public IP address of the actual server. Go ahead and connect to the server you wish to act as a Master. To get started with installing Kubernetes on a Debian based Linux machine, follow the steps below. Here’s a sample ssh connection to a cloud server. As with our Minikube installation, the server needs to have a containerization software installed. Hence, installing Docker. Once Docker is installed, go ahead and run the commands to install Kubernetes. You can see that apart from kubectl we’re also installing kubelet and kubeadm. You learned about kubelet previously in this walkthrough, however, not about kubeadm. Kubeadm is tasked with bootstrapping the cluster, it creates all the necessary add-ons for the cluster to function properly, and it supports tokens for adding new Nodes to the cluster. The last line in this set of commands will export the IP of the Master as an environment variable, so you can easily access it later on. Just replace <master_ip> with the public IP address of your VM. Initializing kubeadm is as easy as running one command. Important: You’ll see a bunch of output get returned to you in the terminal. There’s one thing you need to keep an eye out for. The command for adding Nodes to the cluster. It will be shown to you here. Make sure to save it somewhere safe. The command for adding Nodes to the Kubernetes cluster will look something like this. To manage the Kubernetes cluster, the client configuration and certificates are required. This configuration is created when kubeadm initializes the cluster. This command copies the configuration to the user’s home directory and sets the environment variable for use with the CLI. It may happen that the environment variable is reset if you create a new ssh session with the server. Then you’ll see some funky stuff start happening. Just run the last command again and you’ll have the Kubernetes configuration back the way it should. Or, you can just run the kubectl command with the --kubeconfig flag. From the $HOME directory, where you placed the admin.conf file, run kubectl like this. A crucial step in enabling communication between the Nodes is installing a pod network. I promise these are the last couple of commands we need to run on the Master. $ kubectl apply -f "https://cloud.weave.works/k8s/net?k8s-version=$kubever"
Awesome! Give yourself a pat on the back. Now to check that your cluster is operational, go ahead and run a command to check the nodes. The output from this command will look something like this. That’s it. Done with the Master, let’s connect to a Worker Node in the private network. Setting up a Node is even simpler than a Master. Many of the commands are exactly the same, first of all installing Docker and Kubernetes. Go ahead and ssh into the Worker Node and run these commands as the superuser. Just as with the Master, we run the Docker install command. See the pattern? Let’s install Kubernetes as well. Make sure to change <worker_ip> to the actual public IP address of your VM. Finally, we’re reached the fun part. Remember the cluster join command that got sent back to the output when we initialized kubeadm? We’ll need that now. Go ahead and run the whole command that got returned to you from the kubeadm init --apiserver-advertise-address $MASTER_IP command. Note: The default secure port for the Kubernetes API server is 6443. After you run the command above, you’ll see some output telling you the Node has successfully connected to the cluster. Now, once you ssh into the Master once again, go ahead and check the status of the Nodes in the cluster. You should see them with the Ready status. If you see NotReady instead, give it a few minutes. Note: Remember, you can only interact with the Kubernetes cluster from the Master. It would be a bit inconvenient if you need to ssh into the Master every time you want to interact with the cluster. Kubernetes has an awesome feature though. By copying the config files created during the Kubernetes initialization on your Master to your local machine, where you have kubectlinstalled, you’ll be able to access your cluster remotely. How awesome is that!? To copy the file from the Master to your development machine run the command below. This will copy the config file to the home directory. From there you’ll run the kubectl commands with the --kubeconfig option. Or, if you’re a tidy developer, unlike me, here’s a guide on how to handle multiple configurations. What about those of us who don’t like managing servers? Well, Google’s got us covered. With their Kubernetes Engine, you just have to go through a few simple steps, and you’re ready to interact with a live Kubernetes cluster from your local machine! Incredibly convenient. Take a look above if you don’t believe me. 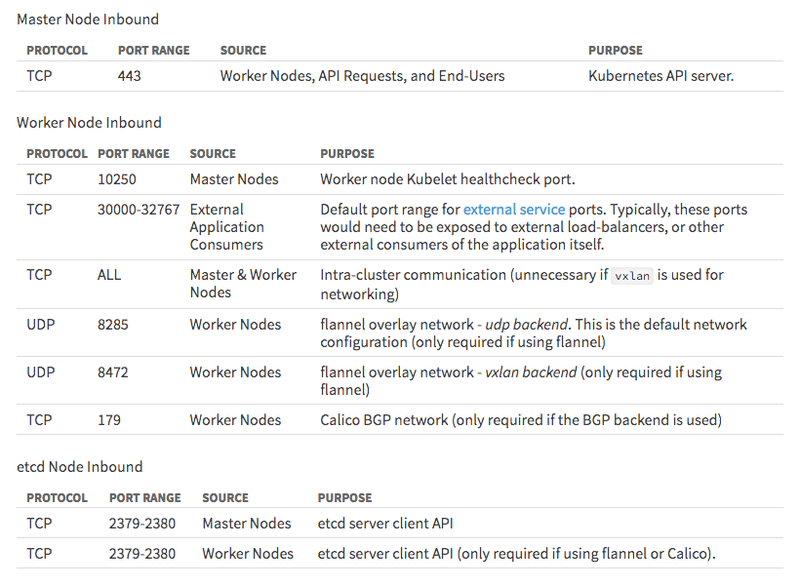 Note: The various Kubernetes objects running just for the sake of keeping it operational all have their own dedicated ports. In case you enable a firewall, make sure to allow them access, otherwise the cluster won’t work right. From this awesome StackOverflow answer. Whoa… That was a fair share of configuring. Finally time to create a real Kubernetes deployment! Hang in there, this will get bumpy. Let’s keep things simple, but still use all the bells and whistles you usually would in a production environment. We’ll create a simple Nginx deployment, expose it through a service, and finally scale it out. When creating a deployment, Kubernetes will automatically create a pods and replica sets for you. Check it out. Once connected to your Kubernetes instance running either locally or in the cloud, go ahead and run the command for creating a deployment. The run command will create a deployment called nginx from the official nginx Docker image. To make sure the deployment is running go ahead and use the get command to check its state. The output you’ll see will look something like this. You have a single pod running in the deployment. But, it’s not visible outside of the private network. To expose it, you need to create a service. Guess what we’re doing next? What if I told you the command for exposing a deployment is actually called expose ? It really is! That’s just incredibly convenient. I enjoy when things just make sense. Anyhow, back to the service. --target-port specifies which port the containers in the pods are running on. To make sure your service is running, run this command. The output will look like this, where the <master_ip> is the public IP address of your Master. Lovely! You have a running deployment and a service exposing a port of your choosing. What now? We’ll, you still need a way of scaling out. Thankfully, Kubernetes has a nifty little command for that. Check the state of the deployment once again, and you’ll see the deployment has 6 pods. Feel free to check the individual pods with the get pods command. Looking great. The Nginx deployment has been scaled out successfully. But, this is just a simple Nginx container. What about a serious application with several containers with the need for persistent storage? That’s a proper challenge. Let’s get crackin’. Great job sticking with me to the end. It’s not until now we’ll bring out the big guns. Creating large scale Kubernetes clusters through the command line is not a sound option, neither for overview, nor mental health. That’s why I’ll focus on using configuration files for deploying Kubernetes objects in this last section of the walkthrough. Note: For huge systems I’d encourage you to use Helm. But that’s a bit out of the scope of this guide. Let’s leave that for another tutorial. Another crucial thing is to enable some sort of persistence to our cluster. As we know, Pods are stateless. If we delete one, the data is lost forever. To solve this, Kubernetes has enabled the concept of volumes. Not to dig too deep, what’s important to note is that a volume is a resource in the storage of a host machine which is at the disposal of all the objects in the cluster. The persistent volume is provisioned by an administrator. We’ll touch upon using Kubernetes Persistent Volumes and Persistent Volume Claims. Unlike the persistent volumes themselves, a persistent volume claim is requested by a user to use resources from a persistent volume. Here’s an example. You have created a persistent volume with the size of 10 GB. But, you want the deployments in the cluster to only claim 3 GB each. Hope that makes sense now. If it still doesn’t, let’s jump right into some examples for you to see. Like I mentioned above, we’ll use yml configuration files for creating the objects in this walkthrough. They are rather understandable to begin with, so don’t be scared. Let’s start by creating a work directory where we’ll keep all the yml files. Create a directory called cluster and open it up in terminal. Let’s start slow and take a see what a persistent volume declaration looks like. Note: I’ll add all the yml files as gists to keep the formatting nice and clean. Otherwise they won’t work properly. We’ll give it a capacity of 10 GB and a host path of /mnt/data/mongo with the Filesystem volume mode. This will create a persistent volume on the host machine. Make sure to create a file named mongo-persistent-volume.yml in your cluster folder. While connected to your Kubernetes cluster, go ahead and run the create command with kubectl. There we go, a new persistent volume is up and running. To list your persistent volumes run the command below. Now we need to add a persistent volume claim, for our deployments to use. Here’s what the yml file looks like. Again run the create command to create the object. There we go! We have persistence. Ready to add some compute? This creation process will be just as simple as what we did above. We’ll create two more files and run two more commands. That’s it! Add the mongo-deployment.yml file above to you cluster folder, and run yet another create command. Taking a closer look at the yml file above. We’re using the mongo image and binding the default port. Apart from that we’re also adding a volume mountpointing to the persistent volume claim we created in the previous step. You can also see we added a tier: backend and app: mongo. This will give the deployment an alias in the cluster, through which it will be discoverable once we add services. Speaking of services, let’s add one. Name it mongo-service.yml. Check the labels! This service will find all deployments with the app set to mongo and tier set to backend and expose them to the cluster network. The ports setting will make sure to let traffic through the default MongoDB port 27017. Finally, run the command to create the object. The Node.js deployment will not differ significantly from the previous we created above. It will also have one deployment file and one service file. You can see we’re adding this deployment to the backend tier as well. However, we’ll add 9 replicas and set a rolling update strategy to ensure maximum up-time even during updates. The image from which we will build the containers housed in the deployment pods is a tiny boilerplate API I wrote a while back. It has basic authentication, which is perfect to test out our new cluster and persistent volume. I’ve also configured the database connection string to point to the MongoDB app label we specified in the mongo-deployment.yml file. What’s left is to add a service and that’s it! Check this out. The node-service.yml will be a load balancer! It’ll route all the traffic through port 80, in a round-robin fashion, to all the replicated pods in the deployment. How cool is that!? Would you believe me that’s all you need? I’m not even kidding. But, let’s be responsible developers and test it all, to make sure it works. First of all, check whether the resources are running like they should. This command will return back to you a list of all deployments, replicasets, pods and services. Verify it’s all running. Once you do, fire up a REST API testing client, such as Insomnia or Postman, and test a few endpoints. Hitting the IP address I set as external on the route /api, will return a simple string telling me the Node.js API is working like it should. Let’s try registering a new user. Hit the /api/auth/register endpoint, and send along some JSON data in the format of an email, name, and password field. That worked! We got a token returned back. Let’s grab the token and add it to the x-access-token header in a GET request to the /api/auth/meendpoint. This should return back the info of John Doe we just registered and authenticated. Lovely! That worked just as we expected. Now, just to make sure, hit the /api/users endpoint to verify the user has really been added to the persistent volume. Feel free to restart deployments to assure yourself. Because we added the Retain setting in the persistentVolumeReclaimPolicy any deployment will re-use the existing data once it gets re-started. How convenient is that! With all that over with, we’ve come to the end of an incredible journey. Give yourself a pat on the back. You now know the basics of Kuberentes. Kubernetes eases the strain on using Docker containers in large scale production environments. I for one would never want to use anything but Kubernetes, because of the huge burden in takes off of my shoulders. Kubernetes, is a system for automating deployment, scaling and management of containerized applications. With Kubernetes you won’t have to put up with deployment headaches and angry clients shouting at you because their website is down. That’s why you need it! To have peace of mind. If an instance fails, Kubernetes will re-create the resources of the failed instance on one that’s running. You don’t need to worry about every instance you own, neither do you need to worry about whether the containers are running. I’ll let that speak for itself. Until next time. Happy Klustering! If you want to take a look at all the code, and terminal commands, we wrote above, here’s the repository. Or if you want to read my latest articles, head over here. Do you think this tutorial will be of help to someone? Do not hesitate to share. Don’t forget to show us some love by following the Sourcerer blog!